My clients are not pissed, not canceling, don’t really care and furthermore are more irritated with the BEST CRIM DEF ATTY IN Austin whining on the phone. Really, I feel like Lady GA GA – thank you for your comments, I’ll take them good or bad. I have a backbone, I tell the truth, I am not scared of cyber bullies and I’ll stand up for my clients like I have for 13yrs+ hence why I was the #1 rep in LexisNexis/Martindale-Hubbell (and internet specialist) in the country. I don’t justify the traffic to my blog, I don’t blog to bully Mr., I damn sure don’t love myself more than my clients, I don’t lie to make myself look better on my blog, and I’m a little more ladylike and don’t point fingers back in the grubby lil noses of pretentious internet amateurs trying to practice url. Copy machines have a hard drive – Attorney Client Privelage – Beware! How many of us would believe that a Copying Machine would need a hard drive similar to what you have in your computers??? I always assumed that when you placed a document into a Copying Machine, the scan would be transferred directly to the copy paper. Not so and this has awesome ramifications as described in the attached video of a CBS investigation. Check it out at the below web address. It will blow your mind and you need to tell everyone you know about this. Makes you wonder what the people at Kinko or the US Postal Service do with their coin operated machines that some of you may use for your important documents!!! Better to be careful than sorry! Traditional marketing rules can’t be applied to social media for the simple reason that it’s not a marketer’s platform. It belongs to consumers! First and foremost, businesses should bother with social media marketing because that’s where the people are. Your customers–over half of them according to most current data–have already made a purchase based on recommendations they received through a social media site. Over 250 million people use Facebook every day. If it were a country, it would be the fourth largest, smaller than the United States but larger than Indonesia. And it costs nothing to join. People are already talking about you. I get phone calls nearly every week from a business owner or marketing executive who wants to hire my company to “do something” about a negative comment on a consumer-review site like Yelp, stop a rumor that’s spreading around Facebook, or repair the damage to their reputation from a story a customer posted online. Most companies give only lip service to customer service. And the Internet has given a huge megaphone to every customer who feels they have been treated badly. The customer is no longer reduced to fuming silently or writing a letter to the corporate offices. Today, that customer has a worldwide voice–most likely a Facebook profile, Twitter account or a membership to a consumer-review site like Yelp. And if she doesn’t, she has a friend who does. The only choices really left to marketers are to become part of the conversation by building a solid social media presence, or wait to react when the conversation involves them. Looking forward to it – for all the FW attorneys, I’ll have a really cool give-away. Make sure to come by my table and drop your card in. ATLANTA — One group is taking freedom of speech and freedom of expression to the limits in a series of Metro Atlanta highway billboards voicing strong opinions against President Barack Obama. The billboards are the latest move to sway public opinion — and for a price you can have your say. The group behind the billboards call themselves BillboardsAgainstObama.com. Two of the billboard locations are on Interstate 85; one is at Spaghetti Junction and one along Peachtree Industrial. 11Alive News contacted the Web site owners today via e-mail and they said they would not reveal who they are or where they are based. They said they simply rely on e-mails to communicate. So far, the nameless head of the group says their Web site has received more than 1,800 hits and that contributions that go toward paying for the billboards. There is no indication that any one person is paying for any one display. The group does say it’s getting some negative feedback on the Web site, but the site says the amount of money being raised to expand the program. So far on the Web site, there are three anti-Obama messages to choose from, and contributors are given the option to create more. You’ve got to be tired of working your coctail off, paying huge amounts to some company who has been around for ages and taking your money for years….I mean, come on, aren’t you sick of it???????????? Really now, attorneys are smart enough not to be brainwashed into paying HUGE monthly nuts just because some company says they’ve been around forever. Huge companies, and some small ones, sign you up on a contract for web site marketing for their firm for a year. That’s fine! But year 2, 3, 4, 12, 13, etc roll around and you pay more and more and HELL EVEN IF YOU PAY THE SAME, that’s a rip off in itself. By God, let’s be clear. YOU JUST DON’T HAVE TO IF YOU DON’T WANT TO AND IF YOU’RE SMART, you’ll figure a way to grow with the times of the web, keep it current, but not pay for a site over and over again. When they say “we’ll add pages, content” then just pay for the added pages/content/or whatever. But not the whole damn thing. I really want to help you understand that you worked your tail off and that extra money should be a collega tuition/savings or a vacation, new furniture, a raise for yourself. Please don’t just throw that money into the wind. I’ll be happy to help you, educate you, inform you and share all of my 13yrs plus of knowledge. What I mean by this is that if you are contracted with a company and it’s end of your agreement, IGG (Internet Guru Girl) can move your site to us for a nominal fee and eliminate your monthly nut. I’m specifically talking about the web site itself only in the example below. You have a site with another company, you’re paying $1000/mo or $12k/year, it’s your site to take w/you if you elect not to renew. I can move it and literally save you $9900 for the year. It will still continue to do what it is doing right now. Now if you have other services with a company and you aren’t sure if they are worth keeping, IGG will do a complimentary analysis and advise you at no charge. Professionally, more than likely there will be features that are in your best interest to keep and I’ll certainly encourage you to do so. There is a huge myth with larger companies to sell you into monthly payments, and hold your site hostage, and even brain wash you to continue paying for this in your 2nd year throughout the years of your relationship. This is NOT IN YOUR BEST INTEREST and is ROBBING YOU OF YOUR HARD EARNED DOLLAR. Look forward to hearing from you when you are interested in saving money while maintaining a great presence on the web. Just want to share that I am not perfect. As you all know yourselves when you’ve had a bad partnership and one of the parties gets the short end of the stick. In more ways than one. The professional thing to do is to move forward, keep your head up high, and not speak badly so that you do the right thing when others are doing the wrong thing. What I am is severely loyal, to my clients, my family, my friends. As many of my attorney clients know from first hand experience, I am able to take the heat on a mistake but more importantly I fight tooth and nail for my clients to be treated fairly and not be screwed with false promises or overpaying or any other problems. I’ve gone to battle for many clients and even have clients still call me for advice from another former employer. I stop and help them, because that’s what I do. I’ll continue to help anytime I can and when needed. My former employer has not been very professional by disclosing opinions as false truths. Remember, as always, you can be forthright to me, I will always advise what is in your best interest and not my own. I welcome anyone to always contact me first hand to know the TRUTH. That’s why I have been so blessed in working with the legal vertical for over 13yrs. My reputation is “precious to me,” and I’ve worked too hard to be bad mouthed. Hoping you all are having a great short break with your families, and a little time away from work. Remember to give thanks, we are all so very blessed indeed. It is now spring, the sun is pushing through, the time has changed, our children and animals are loving the outside weather. Most of us are experiencing a little breakthrough financially with income tax time and able to meet the needs we have personally and our business is picking up. The flowers cheer us up, looking up vacation destinations for the summer or kids camps, proms, etc. We at IGG (Internet Guru Girl) pray that you are happy and blessed without borders. Although the “thud” wasn’t verified until this afternoon, it seems that an online giant fell a couple of days ago. 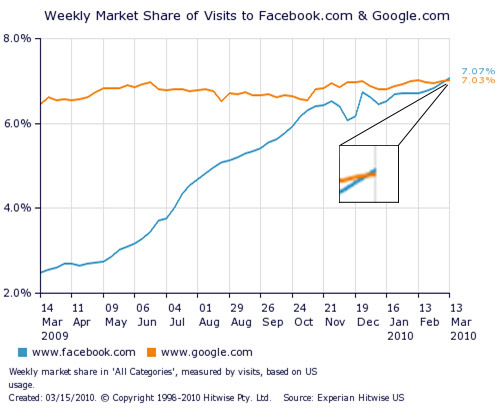 According to new data from Hitwise, Facebook managed to beat Google in terms of visits between March 7th and March 13th, becoming the most visited website in the U.S. for the week. The graph visible below makes the changeup pretty clear (blame the sloppy enlarged bit on us, not Hitwise). What’s more, it doesn’t look like Facebook’s going to relinquish its lead anytime soon. Micro-blogging is defined as a fast or quick update usually containing a few number of characters. It is a popular features of social networks like Facebook where you can update your status, but it has become best known because of Twitter. In essence, micro-blogging is for people who want a blog but don’t want to blog (or who don’t want to spend time writing lengthy information). A personal blog can keep people or customers informed on what is going on in your business, but not everyone wants to spend an hour creating a beautiful post about any subject. So what is Twitter? It’s a great place for keeping people informed about what’s going on with your business, sales, specials, areas of law, information, resources. While Twitter may have started as a micro-blogging service, it is grown into much more than simply a tool to type in quick status updates. So when asked “What is Twitter?”, I often describe it as a cross between blogging and instant messaging, though even that doesn’t do it justice. Turn on CNN, Fox News or any other news-reporting service and you’ll likely see a news ticker streaming across the bottom of the television set. In a digital world that is relying on the Internet more and more for news, that streaming ticker is Twitter. Less than a year after it became the social networking king in worldwide traffic, Facebook has surpassed MySpace in U.S. traffic. In a huge surge of traffic over the past two months, Facebook even beat my prediction by several months. The statistics released by Compete.com also show a huge gain by Twitter, the micro-blogging site going from 22nd on the list to 3rd with over 54 million visits in January. But the surprise move was made by movie social networking site Flixster, who went from 16th to 4rth with 53 million visits. Not quite as big a jump as Twitter, but then again, everyone knew Twitter was a fast-rising star. Another fast-rising star on the list was Ning, the social network that lets you create your own social network, which went from 23rd on the list all the way up to 12th on the list. The tort “reformers” won’t be happy with this; yet more evidence that medical malpractice lawsuits are not the problem with healthcare costs. Fewer medical malpractice payments were made on behalf of doctors in 2009 than any year on record, according to the National Practitioner Data Bank. This finding contradicts claims that medical malpractice litigation is to blame for rising healthcare costs and that changing the liability system to the detriment of patients will not curb costs. The value of malpractice payments was also the lowest since 1999. Adjusted for inflation, payments were at their lowest since 1992, a Public Citizen analysis of the NPDB shows. Also part of the article, malpractice payments on behalf of doctors equals just 0.14 of 1% of overall US healthcare spending. And for that, there are people who want to close the courthouse doors. You can read the rest here: Analysis: Medical malpractice payments continue to fall. With the movement by search engines toward universal and personalized search, thinking like a local business owner is becoming more important than ever for many law firms. As you know, Google’s local business listings have prime real estate on their results pages. Couple that with the fact that the listings contain phone numbers, addresses, website links, and your location on a map, and appearing here can be stronger than appearing in the natural results below. Google is also experimenting with paid local business listings. These listings are currently available in select markets. Optimizing your listing can have significant benefits as far as getting more impressions (how many times your listing appears) and conversions (visitors taking some action to turn into a new lead). Here is some great information about what to do and what not do when it comes to local search ranking factors. Gyi Tsakalakis is a co-founder of AttorneySync Lawyer Internet Marketing, and co-authors a variety of lawyer marketing resources. Aaryn Lamb has a fantastic location right off main street in Grapevine not too far from the old rail road. 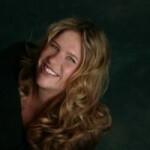 She practices in Tarrant and Denton counties and has a full family law practice. Take a moment to learn more about her and know first hand from IGG that she is approachable, personable and professional. I’ve known Chris Davis for many years and have never needed to use his services. There is simply nothing like a “great” referral. His ability and innate sense of looking outside the box is extraordinary. He concentrates in Personal Injury Litigation, Insurance Fraud, Business Litigation and occassionally divorce. I’ve been privelaged to see him in action and to put pieces of the puzzle together when it just doesn’t seem possible. graciously featured IGG with information about what sets us apart from everyone else. Occassionally you’ll see things that aren’t information based for web marketing. I feel it to be necessary to share personal feeling about people you love or care about and serious situations or death. I also feel that some breaking news info is critical and often is an opportunity for firms to take advantage of positioning their firms when the public needs them most. I hope you all who visit enjoy getting the absolute truth about what you need to do, plan to do, and so forth. IGG is doing so well, moving along finely, and I’m here anytime you need help with your online presence in any way. If you’re interested in DOUBLE DIGIT returns, with NO MARKET RISTK…. I”m meeting with the The Coppolo Group and Nick Coppolo himself, a very dear and well respected and influential individual. You CANNOT afford to throw cash at a volitile stock market, if you’re concerned about where you will be financially in 5yrs, The Coppolo Group can educate you about “senior life settlements” which has provided to investors a double digit return in 10y plus years. THERE IS NO MARKET RISK! You’re welcome to email or comment and I’ll oblige in forwarding your information to see if you qualify. Oh my friend, how lucky thou art to have made it to heaven at such a young age. Now that you’re there, life doesn’t seem so tough when God makes it so easy to live in bliss. Today is the day that we say our goodby’s to you and embrace your family with support and encouragement. We cry for you out of sheer love and devotion and fond memories. I can see you walking with your bump and smacking little comments with a grin as you slide by. You are one of the most witty individuals I’ve ever known. May you rest in peace our beloved Darryl Guy. You don’t have to pay ANY company for years on your site!!!!! If you have a website built for $1000/mon ($12k for the year), you should NOT be paying that price for year 2, 3, 4, etc. You should pay some minor fees such as hosting, maintenance of a site (minor money) and ONLY pay for tweaks when they are needed or updating a site, adding pages. But if you do nothing, you damn sure shouldn’t be dropping $1000/mon when it’s a cash cow for all those companies after your first year. IT’S A HOAX. Now, if you have directory listings and the cost of the click per dollar ration is worth maintaining, then you might keep those and most times they are worth keeping. Link building is crucial, social marketing is crucial, and video is a MUST. Link building is a monthly cost and NO COUCH POTATO JOB. Social mktg and video is a “ONE TIME DEAL” NOT a forever let’s make these huge companies rich deal. You simply SHOULD really be MAKING TIME to visit with me. I can save you thousands of $$$$$$$$$$$$$$. You work too damn hard to piss it away. The OWNER OF Internet Guru Girl sais SO!!!!!!!! According to reports, Toyota is expected to issue a recall of 2010 Prius hybrid vehicles on Tuesday, February 9 due to problems with the anti-locking brake system. The recall will be for 2010 models sold from May 2009 through January 2010 and involves 300,000 cars sold in the United States and Japan. More than 120 complaints about the brake system have been reported by Prius owners as of last week prompting NHTSA to begin a full investigation. There is much to be said about what can be done in a template site. You can customize within and even have video. If you need a site and don’t have the finances for a custom you can always upgrade to a custom once you get more adept to the web and online mktg. Link building improves the search engine ranking of your web page if done in specific ways. Besides an improved search engine ranking, there are certain other benefits that your website derives from carrying out a link building campaign. Link popularity is usually viewed in isolation, and, unfortunately, most webmasters do not realize the complete benefits of a well-defined campaign. While improvement in rankings for specific keywords is a very important objective of link building, it is not the “only” way a link building campaign can be beneficial to a website. Anchor text is the text that falls within a hyperlink leading to another page. The Anchor Text of Incoming Links plays a major role in your website’s ranking in the search engine result pages. Anchor text is very important from ranking point of view as your most important keywords are used in the links pointing to your website which help in gaining rankings in SERPs. For wider keyword coverage, you can work with different link text options. It is important to have a number of combinations of anchor texts and associated link texts, so that the linking does not have a fixed pattern that the search engines can detect. This has become even more significant due to recent Algorithm updates of major Search Engines. If you have more number of quality links pointing to your website, the keywords within your anchor text would benefit your website’s ranking greatly for those particular keywords. The web page of your site that the link is pointing to should also be optimized for that keyword(s) in order to properly influence rankings. As you can probably infer, anchor text is incredibly important in SEO terms, and warrants its own article. The next article will cover the finer points of the anchor text element. PageRank is Google’s measure of importance assigned to a web page on a scale of 1 to 10. By undertaking a long-term link building campaign , you can boost your website’s PageRank and improve your website’s ranking significantly. Most other major search engines have adopted this logic in their own algorithms in some form or the other, varying the importance they assign to this value in ranking websites in their search engine result pages. Search Engines consider your website more important if more links point to your website. Link Building also benefits you by way of getting direct traffic to your website. Incoming links from other websites would surely pay high dividends, as users are likely to click on that link and visit your website, thus bringing you direct traffic. The links placed on relevant pages would enhance the amount of relevant traffic to your website. A well planned Linking Popularity Building Campaign can also help you target your potential customer market and thus increasing the amount of valuable traffic to your site and thus even help improve your sales to some extent. While indexing a page, search engines would also index the links leading from that page even if they are embedded very deep in your site structure. Search engines while indexing that particular page would also learn about the other links within your website and move on to index other pages too.. Many of the Search Engines used to find it difficult to index the dynamic pages. With links pointing to dynamic pages the search engines would index those dynamic pages too. Optimizing dynamic pages is little tricky, but you can have your dynamic pages rank well for various keywords with the help of Link Building techniques. A perfect match of Only Incoming Links and keywords in the Anchor Text can do wonders to boost the organic ranking of the dynamic pages in your site. Link Building gives your website wider search engine coverage. In many Search engines you might have not submitted your website, but in due course of time, the search engines will identify and pick up links to your website from other websites they recognize and index your site. This includes some important paid search engines (such as MSN, Ask) that you may not have submitted your website to them. All search engines do not list your website for free, but would pick a link to your website from other websites they recognize, and eventually list your website in their result pages. Link Building would also mean that your website stays ahead of your competition for your targeted keywords. More the number of Only Incoming Links pointing to your web pages, higher it gets ranked in the search engine results pages. Using your targeted keyword phrases in the links text would ensure a good ranking for your targeted keywords in the SERPs. Online video is probably the most powerful marketing tool you’ll ever use online. Perhaps many of you already know that having video on a website produces better conversion rates; but how many of you know, or even thought about the SEO benefits of having video? Web video is a disruptive technology that is changing the SEO game; Google purchased YouTube for $1.65 billion – is it wise to say that their algorithms have been changed/enhanced for web video? Of course it is. It’s been proven that one can obtain a good ranking on Google overnight using web video – this requires the right skill set and up-to-date knowledge; Google now rates video higher than large articles, videos that have good relevant (metadata) titles, descriptions and keywords used for the video’s name (i.e. instead of using 77034_jp.mp4, use hotelname-kings-lynn-norfolk-east-anglia.mp4) – are more likely to be brought forward within the SERPS (search engine results pages). The inheritance tax used to be $650,000. About ten years ago, Congress raised it to 3 million. It is a “sunset” law or “a ten year law”, which means if Congress does nothing, the 3 million will revert back to $650,000 before the fiscal year ends about August 2010. Chances are under the present “we need your money Congress”, no action will be taken so they can return to taxing any inheritance you leave over $650,000 at a rate of 55%. It is a perfect opportunity for them not to do anything and increase revenue while most people are unaware of this sunset law. If this concerns you, you may want to google inheritance tax law sometime about August, as congress’s fiscal year is Sept. to Sept.
You may even want to write to your congressman and pass this information on to friends. There are a lot of lawyers and CPA’s that do not want congress to act as they will benefit by the work it will generate for them, setting up bypass trusts, etc. Obama passed a bill helping those who could lose their home, try to keep it. Many of us made good or even great money over the years and 2009 to current has been quite the opposite. Not everyone qualifies, but many do. Supposedly if you do qualify, you can decrease your payments up to 30% monthly for 5yrs and after 5yrs even get $5000.00 back for being ontime and doing the program. IGG wishes you good luck and hopes this will help you! FindLaw continues to have problems with its so-called law blogs. Today’s problem: Their writer doesn’t appear to know a damn thing about law. Jeff Holzknecht died this past week of cancer. We are all disheartened by the loss. For anyone who knew him, please remember to pray for his family. We all know he is in heaven and pain free. Jeff, here’s to you, your laughs, goofiness, fun, silliness and me being blessed just by knowing you and working with you. You are shining bright and you have your own star and it will gleam over your son and daughter and all of those who love and treasure you. I personally will miss you. But I know you and Mike McCormick are in heaven and high on the hog. You two keep a spot for all of us still stuck down here on earth in this terrible economy working like slaves. There is no way to get a website up over night, write content or optimize the information. But if you’re a litigation or injury attorney, there is some serious homes that are sinking and if you need to get something up immediately on the internet, an online press release is the fastest way to do so. IGG can certainly help you do this. Fake fragrances may contain such nasties as urine, bacteria and antifreeze which will be absorbed into your skin along with all the other active ingredients. The magazine exposes counterfeit perfumes in its January issue. Authorities in Britain and Ireland detected urine in some of the fake fragrances they seized. It may be used as a ph balance stabilizer and for its color, according to the report on ABCnews.com. Dermatologist Jeannette Graf, of Great Neck, N.Y., told ABC that a real perfume doesn’t cause a reaction, but she’s seeing more cases of contact dermatitis and skin inflammations brought on by the counterfeits. “They will invariably say that they felt different as soon as they put it on. They felt burning. They saw redness. It felt uncomfortable, it didn’t smell right. And that’s almost immediate,” Graf said. Graf believes that the spike in cases is the result of fake perfumes being sold on the street and on the Internet. “People have access to things … they would not have necessarily had before,” Graf told ABC. An ABC News undercover investigation documented shelves upon shelves of fragrances that experts said contain the telltale signs of counterfeits. “We see it happening every day. I mean, whether it’s vendors [selling] out of their trunk at athletic events, whether it’s kiosk-type people at flea markets, sometimes, they actually get into the shopping centers,” Elaine Marshall, North Carolina’s Secretary of State said. SAN ANTONIO—Some residents of a Northwest Side neighborhood awoke early Sunday to strange creaking noises. Eugene Dumais noticed a large crack in the side of his house as he was leaving for church around 9:45 a.m. When he returned, a 10-foot-wide section of retaining wall had slid away. 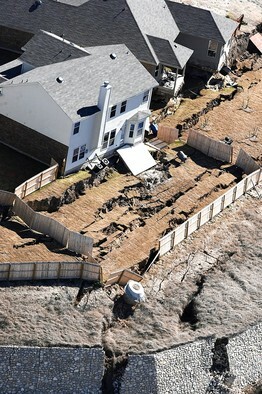 Elsewhere in the 80-home Rivermist subdivision, soil gave way and left crevices up to 15 feet deep and eight feet wide. Associated Press Crevices, some 15 feet deep, are shown outside three homes at the Rivermist subdivision in San Antonio on Monday. “It’s bad, and it has gotten a lot worse,” Mr. Dumais said. He was among dozens of homeowners evacuated over the weekend from the neighborhood—a freshly built enclave where home prices range from $170,000 to $250,000. Centex Homes, a unit of Pulte Homes Inc., told about 250 residents who crowded into a hastily called meeting at a local hotel Monday evening that it had yet to determine what caused the mishap, though it said the soil weakness occurred in a relatively isolated area. An executive said the company planned to start “forensic” work Tuesday, a process expected to take a couple of days. Residents of more than 60 of the 80 homes vacated under a mandatory evacuation order by the city have been told they can return. Still, many at Monday night’s meeting weren’t anxious to return without a better explanation from Centex. Centex said it was temporarily paying for evacuees to stay in hotels. The company said it had spent most of Monday using piers to shore up homes in the area where it believes the problem began. It also used backhoes to remove soil from a hillside below many of the homes. At least seven streets had to be closed after the soil started shifting. Fire officials estimated the ground had been slipping at a rate of about four inches an hour, the Associated Press said. Pulte said that after a thorough review by third-party geotechnical and structural engineers, the company was helping coordinate the re-occupation of the vacated homes. Jeff Davis, an attorney who had been asked to attend the event by one of the homeowners, said a better explanation of the problem was needed, both to reassure homeowners and to protect their investments. Difference between content written for you and you writing your own..
It’s super important to know that when content is written for your site, that you allow the professionals to write it for you. Writing content for a site is a skillful art incorporating keyword phrases, custom writing so that no one has the same content you do. Your site will never gain the credibility of the search engines if it doesn’t have the magic you need for them to recognize your site and hold it’s content in high regard. Old content can hurt a site. Canned content can hold your site back. There is no outsmarting the search engines and trying to get to the 1st 2pgs of results is with a properly built site from Userability, Look, Content, Navigation, and much more. Thank you all for reading and I’ll be super busy this week but promise to add info to help you. This morning, IGG wants to share that we should keep our children close to us, stay in tune with them, love them, adore them, boost their confidence. This mornings post is dedicated to the sweet 4th grader who hung himself and his family who is great need of prayer and that God be with them all. Google first announced a new kind of search – universal, or blended, search – back in 2007 that, in addition to text-based results (web pages), would integrate different kinds of results such as video, images, and news, just to name a few, and in late 2009 Google added “real time search” integrating updates from Twitter and social media sites into search results. Before universal search, search engine optimization was all about creating remarkable content that people would link to and would be optimized for certain keywords so that your web pages would show up as one of those top 10 search results (the first page). But now, those 10 spots are cut down to 9, 8, 7, or fewer. Some of that old real estate is now reserved for different kinds of content across the web – video, images, etc. – that are on their own ranking algorithm. There are new opportunities to get on that first page of search results, and businesses need to create multimedia content or video to take advantage of this new real estate. That means posting videos to YouTube, photos to Flickr, and tagging this multimedia content as thoroughly as possible. With these new, visually appealing, search results part way down the first page of search results, there is now a visual barrier that focuses users’ eyes even more on the top of the search results page. We already know from eye tracking heat map analysis that users focus on the “golden triangle” (planted in the top left hand corner of the SERP) and few people scroll to the bottom of the page or go on to the second, third, etc. SERP. It’s very possible that this multimedia will continue to focus users’ eyes on the top of the first SERP, so your website better be one of the first search results. 3) How Do You Convert Viewers of Multimedia? Creating content is the absolute best way to attract more prospects to learn about and engage with your brand – on your website as well as social media sites like Twitter, YouTube, or Flickr. But how are you supposed to turn YouTube video views into leads and sales for your business? With this new SERP real estate going to multimedia content, this issue has become even more pressing. For all of your multimedia, give people a way to further engage with your company, whether it’s by including a link to your website or relevant blog article in the video/image/etc. description, or including your logo or call to action within the multimedia. 4) Are You Listening to Your Customers? This multimedia content is yet another way for content written about you by you, your customers, or fans, to bubble to the top of search results. While you may not yet have posted any multimedia about your company, your customers are most definitely already talking about you online, in a variety of ways and mediums. Universal search results make it that much more important for you to listen and engage with your customers online, so that you know what they’re saying, and so that you can promote flattering content and respond to negative criticism. Hosting your own blog gives your blog a professional appearance, because you can use your own domain name or website name and can host your blog on your own website. If you do not host your own blog, you will have a lengthy blog URL which will make it appear less professional and will make it more difficult for readers to recall the name and website for your blog. Another benefit of hosting your own blog is the fact that you have a lot more freedom regarding the design. When you host your own blog, you do not have to follow a pre set design but can design your own blog layout instead. By hosting your own blog, you can make your blog easier to recall among readers. What address do you think is easier to recall, http://www.blogsite.com or http://blogsite.blogger.com/~blogname? The easier your domain name is, the easier it will be for readers to recall it, and this is one of the greatest benefits for hosting your own blog. While there are not normally really strict guidelines regarding content, when you have your blog hosted by a blogging network, your choices in content can be restricted. By hosting your own blog, you can have much larger control over your content. By hosting your own blog on your own website, you can have more control over your security, and will be better able to protect your own blog rather relying on someone else to do it. By hosting your own blog, it will be easier to develop and promote your own brand. Even if you are not selling something, hosting your own blog will provide greater individuality than what shared hosting can offer. When you host your blog with someone else, you have less control over generating revenue. When you host your own blog, however, you have much greater control over how you generate revenue online. While starting on a blogging network makes sense, if you want to grow your blog, you need to go independent. By hosting your own blog, you can create a much larger level of growth over time. By hosting your own blog, you can integrate your blog with your website, rather than having to create a completely separate website from your blog. Hosting your own blog will also allow you to generate more traffic, because your posts will be easier to find in search engines. What do links do for my website? Link building is a very important form of self-promotion on the Web. You contact webmasters of other, related websites and let them know your site exists. If the value that you have worked so hard to instill in your site is evident to them, they will assist their own customers by linking back to your site. That, my friend, is the essence of link building. Think of link building as your opportunity to build your reputation on the Web. As your website is likely one of your business’ most valuable assets, consider link building to be a primary business-building exercise. Be careful not to make the mistake of believing it will result in instant gratification. Successful link building efforts require a long-term commitment, not an overnight solution. You need to continually invest in link building efforts with creativity and time and the expertise of IGG. Good things come to those who wait (and work smartly!). How do I get valuable inbound links? Make no mistake: getting legitimate and highly important, inbound links is not a couch-potato task. It’s hard work. If it were easy to do, everyone would do it and everyone would have the superior results – mediocrity. But this is not to say that it is undoablely hard or that successful results are unreachable. Persistence and diligence are extremely important, but so is having something of value, content-wise, to earn those inbound links to your site. This is also why you should have a IGG help you with your link building for your website. What does SEO or Search Engine Optimization really mean? heating up, as the site became the most visited website in the United States for the third time in a one week period. On New Year’s Day, Facebook was able to surpass Google as the most popular website in the United States based on recent data from Hitwise. The trend is clear: Facebook is on the fast track to becoming the largest global internet site. Video does several things for your site. It’s important to transcribe the content in your video to optimize it, youtube it, and for the search engines to pick up what you’re saying in the video as content. Then for the actual visitor to your site, information to read and video to listen to, keeps them in your site longer and ULTIMATELY YOU HAVE A HIGHER CONVERSION RATE. Video builds instant rapport! Facebook, myspace, linkedin, all of the social sites build rapport because you are interacting with the pool of referrals or potential or even current clients and they feel comfortable with you. Let’s say your main site is fairly broad in it’s areas of practice. However, you’ve discovered some lucrative niche keyword areas within that broad topic area. (ex. within family law, you are having some good results with “father’s rights”) By creating spoke sites (ormini sites orlanding pages), you can focus on these keyword areas, and dig deeper, without compromising the general appeal of your main site. Thank you everyone for clicking on and visiting my blog. I had close to 50 visitors in 24hrs and that is why social marketing is a MUST!!!! There are 5 top reasons why it is essential you use this method. Here are the 5 primary reasons why this promotion strategy is a must for any online business. 1. You can link from your social profiles to your web site or web sites which is a super credible link which in turn drives more traffic to your site. 2. With social sites you will be able to direct and keep the traffic you have easily. If you use a blog for this marketing method than it is a simple as posting regular quality articles to keep readers interested. Plus this method is easy for anyone to use if you take time to learn a little about using each social site effectively. Many of the ways to advertise with this method are free and if they are not then they are affordable for any budget. 3. Social sites let you build trust and develop relationship with customers. We sell ourselves and being personable is crucial. The more you socialize and get to know them the more they will trust you and spend money with your business or be inclined to hire you. 4. Because they know that it is all about the quality of the traffic and not the amount of traffic many business owners use this method. It doesn’t matter if you get a huge amount of people to your site if they are not ready to buy or hire you for your service. With social advertising you can be sure you are reaching targeted customers that are looking for what you are selling. The more involved you become in the social sites the better for your business. 5. Your referral business will always be 1/3 of your business and in order to maintain that, you should keep yourself in the pool of your referrals. So, make sure to add new contacts such as your new clients, go on and make a comment occassionally at least. Keep your business in their face. The more involved you become the more times your site will be available in the results. Keep using these sites on a regular basis and you will soon see an increase in traffic and sales. These are the main 5 reasons why you must be using social marketing for your online business. If you are not using this marketing method than you are leaving a lot of money on the table and letting your competitors have all your customers. Thanks for clicking to see what’s going on. You’re now one of the first to see my new logo. After many years of working for a big company (Martindale/Lawyers.com) and then a startup, I’m so happy to announce that I damn sure have ways that will grow your practice online, save you money, give you proper customer service as I have always and more, and tell you exactly what you don’t want to do that the other companies are brainwashing you into. This is my blog, and I own this company, so for all of you who know me, appreciate me and my candor. For those who don’t, I’m very forthright, honest and work super hard to make sure you are treated the best.